Chocolate Fudge Ribbon Cake Deliciously Moist Chocolate Fudge Cake with a ribbon of Cream Cheese through the centre. Bacon Bene Free Range poached Eggs on top of Bacon and freshly toasted Kapiti Artisan Sour Dough drizzled with creamy Hollandaise sauce. RiverStone Cooked Breakfast Cooked Breakfast any way you like it …. Fried, Poached, Scrambled with Bacon, Sautéed Mushrooms, Kransky Sausages, Chunky Potatoes and Tomato served with toasted Grain Bread. Chicken Salad Freshly marinated Cajum Chicken on a Salad Medley with a fine drizzle of the famous RiverStone Thai Dressing topped with Feta. Gourmet Burger 120gm Beef Patty or fresh Chicken Strips in a freshly toasted Kapiti Artisan Burger Bun with Bacon, Free Range Egg, Cheese, Lettuce, Tomato, Beetroot, Gherkin and our own Caramelised Onions served with fries. Muffin Freshly baked every day with variants like Lemon, Apple & Raisin, Rhubarb, Cranberry & Chocolate, Feijoa, Plum & White Chocolate and Savoury. Nacho’s Toasted Cheesy Corn Chips topped with our own Beef and Chilli Beans, finished with Sour Cream, Avocado, Cheese and Spicy Sweet Chilli sauce. Pumpkin & Kumara Soup Creamy Home Made Pumpkin & Kumara soup with a hint of curry, served with toasted specialty bread. Smoked Salmon Salad New Zealand Smoked Salmon Pieces on a Salad Medley with a fine drizzle of the famous RiverStone Thai Dressing topped with Feta. Thai Beef Salad Tender strips of Beef Sirloin marinated with RiverStone’s own recipe on a bed of Lettuce, Spring Onions and Capsicums, topped with Crispy Noodles and Bean Sprouts finished with a fine drizzle of the famous RiverStone Thai Dressing. 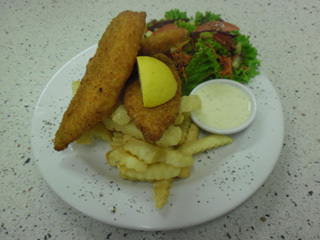 Fish n Chips Panko Crumbed Hoki Fillets served with a fresh RiverStone Salad Medley and fries with homemade Aioli.